Fortunately, my Samsung TV is not that smart, but it makes you think! News this week that Samsung smart TV sends data about your livingroom utterances to every man and his dog is yet another example that we have surrendered our privacy to consumerism. Once your privacy is gone, you'll never get it back. Please be aware that if your spoken words include personal or other sensitive information, that information will be among the data captured and transmitted to a third party through your use of Voice Recognition." I draft most of my blog posts in a text editor before uploading them to Blogger. The advantage is that I keep a local copy (for prosperity or vanity I have yet to determine) and I can play around with presentation and layouts at my leisure. 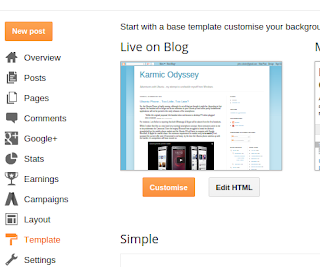 However, it's often easier to get things where you want them using CSS in a text editor than in Blogger itself but, for routine settings, you can customise the style sheet in Blogger and make the changes permanent. 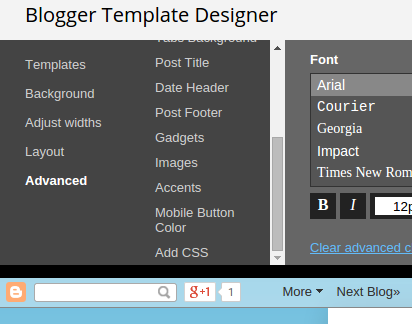 From your Blogger home page, click the more options drop-down list & click the Template option. 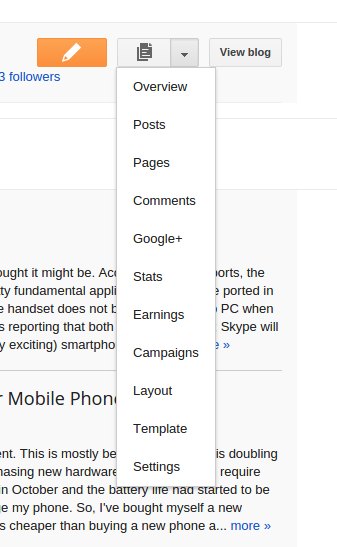 Click the Advanced option & then scroll down to Add CSS option. 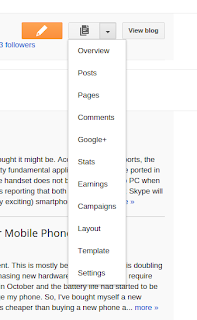 Click Apply to Blog button (top RHC of web page). This should work with any CSS, but bear in mind that it will become the default style once the code is uploaded. In this case, all iframe objects on this blog will be centred from now on. Ubuntu Phone - Too Little, Too Late? So, the Ubuntu Phone is finally coming, although it's not all that we thought it might be. According to first reports, the handset will no longer act as an extension to your Ubuntu pc and some pretty fundamental applications will not be ported in the early releases of the smartphone. For instance, Leo Kelion is reporting that both Whatsapp & Skype will be absent from the first handsets. Whilst I realize that this is a new (and very exciting) smartphone concept, these omissions seem to me to be problematic for Canonical. Even the mighty Microsoft has struggled to break the Android stranglehold on the mobile phone market and the Ubuntu OS will have to compete with Google, Microsoft, & Apple for market share: the minimum requirement for market entry is to match (if not, surpass) the current offer and, if Canonical is not hasty, by the time the Ubuntu phone catches up with the market, it's competitors will have moved on. Of course, existing operating systems are not the only concern for Canonical in an all ready crowded market: in January, Samsung released the Z1 running its Tizen operating system: the significance of this event should not be underestimated, in 2013, Samsung was by far the largest producer of handsets in the world (although the iPhone (all variants) was the largest selling handset (same link)). But, even if you are desperate to own the new Aquaris E4.5 (not a terribly catchy name), you can't just wander down to your local mobile provider and pick up your new handset: you have to wait for a flash sale to pick up your new toy, so Ubuntu's entry into the mobile arena is limited to say the least. Ultimately, only time will tell if Canonical has got this right or missed its opportunity. However, the €170 price tag is undoubtedly attractive and it may be that the phone will find a niche. I for one hope that this venture is successful for Canonical and the Ubuntu operating system continues to find new fans. I seem to be blogging about my mobile phone more than Linux at the moment. This is mostly because my phone is doubling up as my Kodi remote and it is a fabulous free/sunk cost alternative to purchasing new hardware (which may also require modification to work). However, my Samsung GT-19070i is three years old in October and the battery life had started to be problematic: I could no longer get through the day without having to recharge my phone. So, I've bought myself a new battery and now I've got more than 50% charge at the end of the day! This is cheaper than buying a new phone and I should (fingers-crossed) get another year out of the device before needing to upgrade. I read yesterday, that mobile devices can last a decade or more but, in our consumption-oriented world, we're locked into much sorter upgrade cycles: so, I'm also doing my bit to save the planet. "The Linux-based Puzzlephone project wants to extend the life of smartphones by making more of the phone replaceable, on the premise that most of the hardware can last a decade, but consumers are locked into a much shorter upgrade cycle." 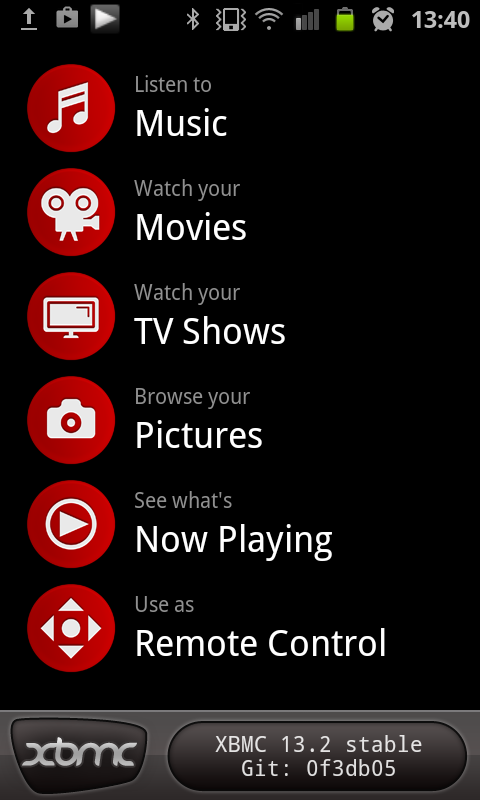 After installing my new HTPC, I discovered that the Kodi remote app (on my Samsung GT-19070P) no longer worked. I'd get no connection or connection refused errors despite being attached to my wireless network and being able to connect to the Internet. I tried everything from enabling/disabling UFW, opening/closing ports, rebuilding the host information, fixing the host's IP address, and rebooting the router. Nothing seemed to work. However, whilst rebooting my router via the web interface, I noticed that my phone didn't appear in the client list - hmmmmm. I'd recently installed a wifi range extender in my lounge and my phone was connecting via this node: simply rebooting the device solved my problem and ended hours of frustration. I'm not entirely sure why the node was refusing to pass the datagram to the router, but it may have just been a glitch in the network layer. Anyway, the moral of the story; you can't reboot enough! Taken last week from the Carneddau looking towards the Glyders - the Ogwen Valley is probably my favourite place. I finally got around to ordering the parts and building my HTPC: I'm thrilled with the results and the total build cost was less than £320.00! So, here are the component specifications (aka parts list) & some detail about the operating system and media software. Chassis - Fractal Design Define Mini Series Micro ATX (Black Pearl). This is a stunning case which is beautiful for its simplicity. The optical drive is hidden behind the front (hinged) panel. Price at the time of purchase £56.98. 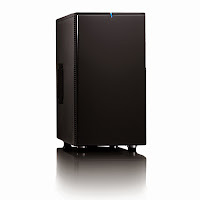 Processor - AMD A6 5400K Black Edition. This is my first ever build using an AMD processor and it took me a couple of minutes to figure out the FM2+ socket arrangements (perhaps I should have read the instructions first!). I've been stunned by the performance of this dual core processor and, from now on, I will always consider AMD for future builds. I'm using the stock fan for cooling which is as near silent as makes no difference and I'm thrilled by this budget processor - highly recommended! Price at the time of purchase £39.99. Motherboard - Gigabyte GA-F2A88XM-HD3 (Socket FM2+): always a matter of preference, but I've always favoured Gigabyte boards. This board is tight to work on as you might expect, but it all went in and connected first time. Price at time of purchase £47.31. Media Drive 1 - Weston Digital Green 1TB hdd - this is my salvaged drive from the NAS that failed last year. The drive still reports that it's OK (although, S.M.A.R.T recognizes it as an old drive) so it's been formatted and recycled. It's a sunk cost so I've counted it as £0.00. Optical Drive - Samsung 24x DVD Writer. Other than the processor, this component is the best value for money in this build: this drive is superb. It comes with interchangeable bezels and is quiet (but not silent) in operation. Highly recommended! Price at the time of purchase &14.75. Networking - TP-Link TL-WN751ND. Another sunk cost but it's performing quite well. Nonetheless, I'll probably end up using a Powerline adapter and an ethernet cable in the long run. As a sunk cost, I've counted this as £0.00. Keyboard/Mouse - Logitech Wireless K400r. This is another sunk cost so I've counted it as £0.00. Nonetheless, I would recommend this keyboard for any HTPC project and, at the time of posting, it's worth every penny of the £27.15 that Amazon is asking. Speakers - DELL setup. Sunk cost counted as £0.00. The connection to my Samsung TV is via the mobo's HDMI port. As a nice touch, you can rename your source (albeit from a predefined list) on your TV. You can also use the HDMI for sound, but I've opted to recycle my old DELL Dimension 8400 speakers which have always been of decent quality. 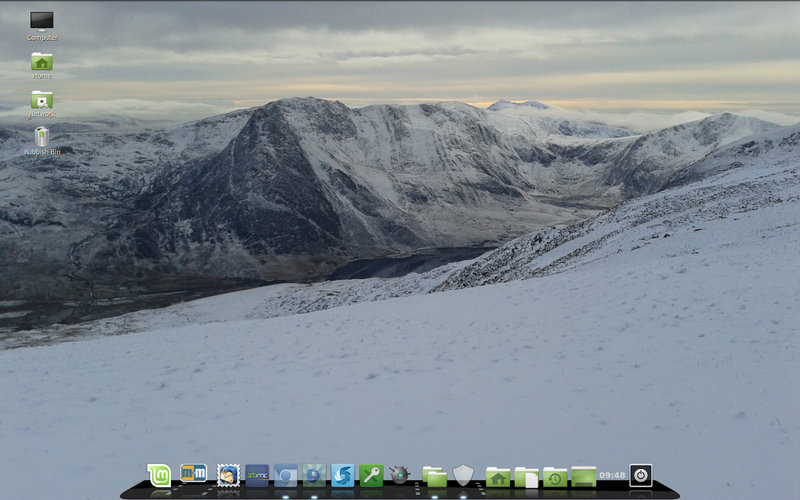 The operating system is (after several false starts) Mint 17.1 with the Mate Desktop. Originally, I had planned on using Cinnamon, but I just couldn't get the graphics to play nice on the 43" screen. I also tried the openelec but, although it looked superb, it pretty much turned my brand new PC into little more than Apple TV. Nonetheless, Mate looks fantastic with the AMD Catalyst drivers & Control Centre installed and I don't need a graphics card. However, it would be nice to have a little more granularity over the graphics performance and I'm reserving judgement on whether to add a dedicated graphics card in the future. For the HTPC software/media centre, I'm using Kodi (formerly XBMC): put simply, this is outstanding software and I'm still exploring all of its functions. Notwithstanding several recycled/reused components, this little system is outstanding for around £300.00. The chassis looks beautiful and is endlessly upgradable: needless to say, I'm chuffed!